An offsite meeting held at a location which fosters creativity can produce surprising results. That quiet reserved employee may openly offer a creative suggestion when he/she is away from the formal cultural environment of the office building. When the attendees are met with a welcoming atmosphere instead of just a handshake and a standard meeting room when they arrive, the tone of the entire meeting can be energizing. A location with multiple settings can be beneficial. Your agenda can be set so that the meeting areas reflect a wide range of functionality from formal to totally casual. 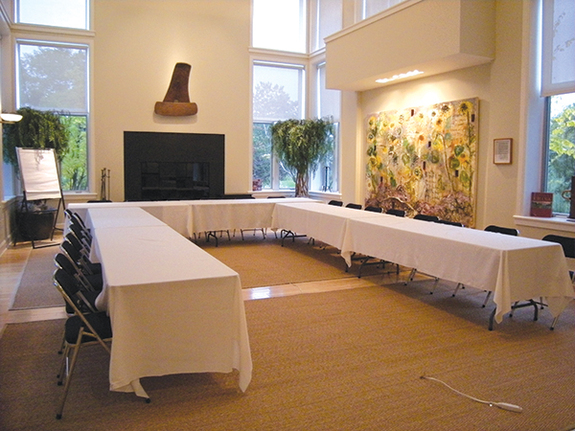 A room with the conference table(s) can be used for the nitty gritty business discussions and processes. However, there are locations having rooms with more than just conference tables in them. Some have more homelike settings with softer furniture along the walls, a coffee table and even a fireplace. A meeting area that has a living room type setting with arm chairs and couches can create a more relaxed atmosphere allowing for unstructured free flowing exchange of ideas. The lighting in this type of room can also be from sources other than the glaring overhead fluorescent lights of a conference room. Windows let in warming sunshine during the day and the softer lighting of table lamps or chandeliers for any evening sessions can be a welcome change. For some of your activities you may want to have a meeting space outdoors. Fresh air, green trees and warm sun create a country setting that will be inspiring. If you choose to do so, be sure to let your attendees know ahead of time so they dress appropriately. For example, if you are going to be using a landscape that is built with flat rocks around a pond or bubbling brook for seating or on a grassy hill, the attendees may not want to wear office type clothing. No matter what your agenda or the ultimate goal of your meeting, a creative location can excite your attendees, generate improved participation and achieve higher than normally expected results. Colerget Conference Center has several meeting rooms available. Call today to schedule your free tour of our facaility and gardens.